Two people hospitalized by MIT as undergraduates have said they felt the decision was either unfounded or inappropriate, and in both cases that MIT did not act quickly to resolve the situation and remove them from what they described as a traumatizing experience. The two, a man and a woman, requested their names remain anonymous for privacy reasons, but for convenience will be referred to by the pseudonyms “Alex” and “Shirley.” Alex was committed in 1998, Shirley in 2003. Both stayed a total of 12 days at McLean Hospital, a large psychiatric facility of Harvard Medical School, and both sought to leave substantially earlier while relying on visiting friends for clothing, personal items or academic work. Neither said that in retrospect being hospitalized was necessary or particularly helpful in fixing the situations that initially led to them being committed to McLean. A spokesperson for McLean Hospital declined to comment. Nationwide, demand for mental health services has been rising on college campuses. The number of hospitalizations at MIT rose from 16 in 1995 to 27 in 2000, according to MIT’s Mental Health Task Force report in 2000, although Siegel said that the number has decreased since then. For doctors to commit a person to a mental hospital against his or her will, they must demonstrate “that the failure to hospitalize would create a likelihood of serious harm by reason of mental illness,” according to Massachusetts general law. Both Alex and Shirley, however, signed a paper agreeing to voluntarily commit themselves; the consequences for refusing can be serious. Given that in both cases, MIT administrators or doctors had documented evidence of a risk of serious harm, they or the doctors at McLean could have pursued an involuntary commitment, which would be valid for a total of six months the first time and could also come with “Roger’s Orders” that give permission for involuntary medication. The student’s status at MIT is also not guaranteed. 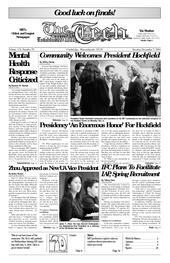 MIT Director of Mental Health Alan E. Siegel has said that following a hospitalization, MIT has to “make a decision about whether we believe it’s safe enough for [the student] to come back.” In Shirley’s case, MIT ultimately decided to send her home after her hospitalization and required her to reapply for admission as an undergraduate. “Massachusetts laws are such that unless there’s a real perceived danger to self or danger to others, you can't hold anybody in the hospital,” Randolph said, so MIT does not make a decision to hospitalize a student lightly. “It would be embarrassing to send a person to the hospital” only for the hospital to find them healthy and turn them away, he said. Shirley went to the doctors at MIT Medical in the late summer of 2003 because she had become extremely unhappy about a disagreement where she might have had to pay several thousand extra dollars for housing both on and off campus or possibly lose her registration as a student. She said she was “pretty much a non-functional person” and “hysterical” at the time, but that she was looking for a “verbal punching bag,” someone at MIT Medical to help her calm down. Girard said that Shirley had “talked about wanting to kill herself” to the admitting physician. She had also been hospitalized once before for risk of suicide for a shorter period of only three days. MIT, including Randolph, sought to commit Alex because of a perceived risk to his hallmates. The wording of the sentence changed several times according to several of his medical documents Alex obtained. The documents cite other evidence for Alex’s hostile behavior, including other angry e-mails, possessing an air rifle, and nailing shut the hall’s kitchen door. Alex said that the gun was owned by someone else on the floor and was turned over to the graduate residence tutor upon request. He also said that he had nailed the door shut to make a point after finding the kitchen in an extremely unpleasant condition, and that the nails were only halfway in and were easily removed. According to his discharge summary, after sending the e-mail about the rifle, Alex “was urgently requested to report to the dean’s office. He replied via e-mail that although he would be happy to come and speak with the dean, he would be unable to comply with this request until his exam periods were finished [Alex’s hospitalization overlapped with finals week]. At this point the dean and MIT psychiatrist, Dr. Gottfried, decided that the patient should be sent on Section XII to McLean,” referring to Massachusetts general law, chapter 123 on emergency restraint of dangerous persons. When he arrived at MIT Medical, he said that Gottfried told him after a brief physical that he was to be committed to McLean. He said the police then strapped him to a stretcher, citing “standard procedure,” and took him to the hospital. Shirley said that when the doctor she had seen decided to have her committed, an emergency medical technician or police officer came to the room and escorted her directly to the ambulance, which took her to the hospital. She said she had no opportunity to bring any personal belongings or a second set of clothes, and had to wait until some of her friends were able to bring her some during visiting hours. Alex, whose hospitalization overlapped with finals week, said he was dependent on his friends to bring him his books and homework and to contact his professors about postponing his exams. Both Shirley and Alex said their contact with administrators or doctors from MIT was very limited. Alex said that only Randolph visited the hospital regarding Alex’s hospitalization, and then primarily to speak to McLean doctors. “The thing that angered me most,” Shirley said, “was that I heard from a nurse that [MIT was] going to put me on a medical leave,” rather than hearing it from someone at MIT. She said she had to wait for about seven days before receiving a visit from anyone from MIT. She said it was Siegel who visited, but after seeing him she then had to wait for him to return from vacation over the weekend to be released. Eventually, though, “I felt like I was never going to get out of there,” she said. “I was so mad I had to wait an extra long time the entire weekend” for Siegel to return. Siegel said that he would visit the student “at the point that McLean feels that they have enough information” to determine how the student is doing. He also said that much of the level of outside contact was dependent on the desires of the student. “We let the McLean staff know to ask the student to please contact the housemaster,” he said, but due to medical privacy laws, MIT cannot inform anyone without the student’s consent. The workers at McLean “were very accommodating, very quick,” Shirley said. She said they were nicer to her than to some of the other patients because she was from MIT. “They won’t talk to you like a baby like they do for the others,” she said. She said there was very little to do in the hospital, which offered basic television, newspapers and board games, but not internet access. He said the length of his stay was due to a consistent conflict with McLean doctors because he maintained that the e-mail was misquoted, and because he had filed a three-day notice for release as permitted by law. The law allows any voluntarily admitted patient to request discharge, subject to a maximum three day delay by the hospital supervisor, but the doctors at McLean saw it as a hostile action on Alex’s part. The documents do not give further evidence for Alex’s perceived risk of harm, and generally refer to him as a “guarded” but moderately social and cooperative patient. Alex, who was a member of ROTC at the time, said that his job after graduation required two further evaluations to clear him for work in the navy because of his hospitalization, and that both examinations quickly found him mentally sound. Shirley said she was ultimately diagnosed as “mildly hypothymic” and bipolar, essentially being unable to deal effectively with depressive mood swings. She said that MIT sent her home after her release from McLean and required her to reapply for admission to return. She also said that Assistant Dean of Counseling Services Kunya S. Desjardins “was adamant about getting me out of there as fast possible,” ideally in one day. Shirley said it was her perception that the urgency was because MIT would be legally liable should she hurt herself while still on campus. She said she was frustrated with having to leave so quickly. She said she felt like “I would really like to accommodate you,” but “I have to pack... [and] get my friends to store stuff for me” at MIT. Desjardins “had an undertone that she really wanted me out of there really soon,” Shirley said. Shirley said that after returning home, she began taking antidepressants, and applied for admission in the regular fall early action program, but was rejected. After that, she said she took the MCATs and volunteered at a local hospital. In general, she said she “just tried to be normal,” but by the summer was “losing all faith” of returning. She said she applied a second time during the spring, and was finally readmitted at the end of July.